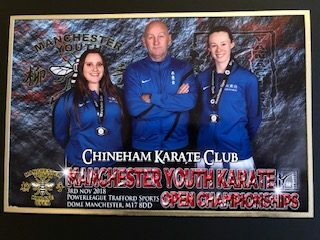 Great success for Chineham Karate Club and for three entrants it was a first, Lauren and Mia at Black Belt level a real step up and a special mention to James who in his first competition ever won his first round which for those that know is a real achievement “well done to you James“. Mia, who after a break of three years from attending competitions joined Lauren in the pairs Kata and they both demonstrated they were at Black Belt standard, she then went on to gain a bronze in the individual Kata. Lauren in her cadet category at kata held her own but did not get in the top three but then went on with several credible fights in the kumite to get her bronze medal. Thanks to the parents for attending and to the support the students gave to each other !!! !